Oligonucleotides can be used to site specifically substitute a single nucleotide of transfected target genes in both Anopheles gambiae and Anopheles stephensi cells. Pakpour, N., Cheung, K. W., Souvannaseng, L., Concordet, J., Luckhart, S. Transfection and Mutagenesis of Target Genes in Mosquito Cells by Locked Nucleic Acid-modified Oligonucleotides. J. Vis. Exp. (46), e2355, doi:10.3791/2355 (2010). Plasmodium parasites, the causative agent of malaria, are transmitted through the bites of infected Anopheles mosquitoes resulting in over 250 million new infections each year. Despite decades of research, there is still no vaccine against malaria, highlighting the need for novel control strategies. 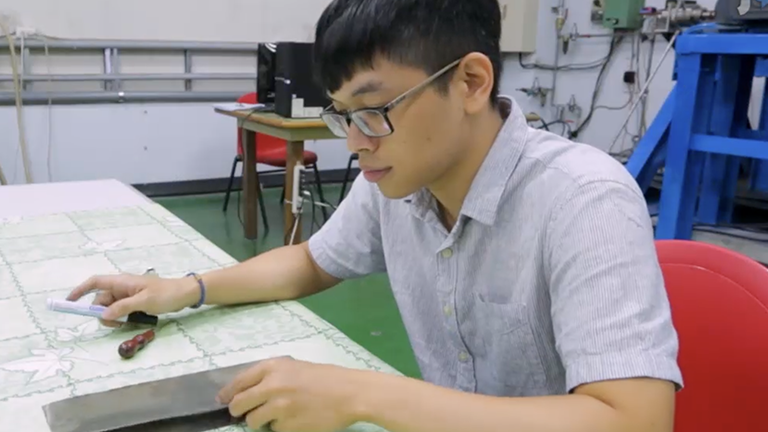 One innovative approach is the use of genetically modified mosquitoes to effectively control malaria parasite transmission. Deliberate alterations of cell signaling pathways in the mosquito, via targeted mutagenesis, have been found to regulate parasite development 1. From these studies, we can begin to identify potential gene targets for transformation. Targeted mutagenesis has traditionally relied upon the homologous recombination between a target gene and a large DNA molecule. However, the construction and use of such complex DNA molecules for generation of stably transformed cell lines is costly, time consuming and often inefficient. Therefore, a strategy using locked nucleic acid-modified oligonucleotides (LNA-ONs) provides a useful alternative for introducing artificial single nucleotide substitutions into episomal and chromosomal DNA gene targets (reviewed in 2). LNA-ON-mediated targeted mutagenesis has been used to introduce point mutations into genes of interest in cultured cells of both yeast and mice 3,4. We show here that LNA-ONs can be used to introduce a single nucleotide change in a transfected episomal target that results in a switch from blue fluorescent protein (BFP) expression to green fluorescent protein (GFP) expression in both Anopheles gambiae and Anopheles stephensi cells. This conversion demonstrates for the first time that effective mutagenesis of target genes in mosquito cells can be mediated by LNA-ONs and suggests that this technique may be applicable to mutagenesis of chromosomal targets in vitro and in vivo. Prior to starting the protocol, it is important to determine that the mosquito cells used in the experiment are healthy and at ~80% confluence if adherent (Figure 1). Overgrown or unhealthy cells will result in low transfection efficiency and will give inconsistent results. Warm up all media prior to use in a 28°C water bath for 30 minutes. A. stephensi MSQ43 cells require E5 medium: MEM, Earle's w/ glutamine, 5% heat inactivated FCS, 0.2% D-glucose, 1% penicillin-streptomycin antibiotic, and 1% non-essential amino acids. Thaw and store all transfection reagent materials, plasmids, and oligonucleotides on ice. All procedures should be carried out in a tissue culture hood using sterile technique. For adherent cells (A. gambiae SUA5B, A. stephensi MSQ43) aspirate off old media without disturbing the cells, add an equivalent volume of fresh media that has been warmed to 28°C, and then rinse off the cells from the bottom of the flask using a pipette. The concentration of cells should be determined and adjusted to a final concentration of 1x106 cells/ mL. Cells can be kept at room temperature while preparing transfection reagent materials. Add 1 mL of mosquito cells (1x106 cells/ mL) to each well of a 6-well plate. Set up a plate for each experimental condition (see below). Table I is a pipetting scheme for a general transfection. Table II outlines five conditions to test for successful mutagenesis of a single nucleotide using BFP-specific LNA-ONs. The first two, pGFP and pBFP, are positive and negative controls, respectively. The remaining are experimental conditions of pBFPs with increasing concentrations of BFP-specific LNA-ONs. In steps 8 through 12, add appropriate volumes of reagent accordingly for each condition. Transfer plasmid DNA to a sterile 1.5 mL microcentrifuge tube and add appropriate volume of EC buffer. For 1 μL plasmid DNA (1 μg/ μL), add 99 μL of EC buffer. For 1 μL pGFP (1μg/ μL), add 99 μL of EC buffer. For 1 μL pBFP (1μg/ μL), add 99 μL of EC buffer. For 1 μL pBFP (1μg/ μL) and 1 μL ON (μg/ μL), add 98 μL of EC buffer. For 1 μL pBFP (1μg/ μL) and 5 μL ON (1μg/ μL), add 94 μL of EC buffer. For 1 μL pBFP (1μg/ μL) and 10 μL ON (1μg/ μL), add 89 μL of EC buffer. Then slowly add Enhancer per 1 μg of DNA used. For 1 μL plasmid DNA, add 8 μL Enhancer. For 1 μL pGFP, add 8 μL Enhancer. For 1 μL pBFP, add 8 μL Enhancer. For 1 μL pBFP and 1 μL ON, add 16 μL Enhancer. For 1 μL pBFP and 5 μL ON, add 48 μL Enhancer. For 1 μL pBFP and 10 μL ON, add 88 μL Enhancer. Vortex DNA/buffer/Enhancer mixture for 1 sec and make sure all of the solution is at the bottom of the tube. Then incubate at room temperature for 5 min. Add Effectene reagent per 1 μg plasmid DNA and vortex for 10 sec. Confirm that all of the solution is at the bottom of the tube and then incubate at room temperature for 10 min. For 1 μL plasmid DNA, add 10 μL Effectene (Table I). For 1 μL pGFP, add 10 μL Effectene (Table II). For 1 μL pBFP, add 10 μL Effectene (Table II). For 1 μL pBFP and 1 μL ON, add 20 μL Effectene (Table II). For 1 μL pBFP and 5 μL ON, add 60 μL Effectene (Table II). For 1 μL pBFP and 10 μL ON, add 110 μL Effectene (Table II). Bring each tube to a final volume of 1000 μL by adding warmed media dropwise to the DNA/buffer/Enhancer/Effectene mixture. DNA may precipitate at this point if the media is added too quickly. Gently mix by pipetting up and down 3-4 times. 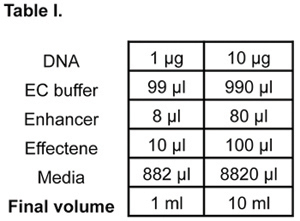 For 1 μL plasmid DNA, add 882 μL media (Table I). For 1 μL pGFP, add 882 μL media (Table II). For 1 μL pBFP, add 882 μL media (Table II). For 1 μL pBFP and 1 μL ON, add 864 μL media (Table II). For 1 μL pBFP and 5 μL ON, add 792 μL media (Table II). For 1 μL pBFP and 10 μL ON, add 702 μL media (Table II). Next slowly add 1 mL of the appropriate DNA/Enhancer/Effectene mixture to each well a drop at a time. Swirl the plate gently to ensure uniform distribution of cells and transfection mixture. Incubate cells under normal growth conditions. One day after transfection, gently aspirate out media and slowly replace with an equivalent volume of freshly warmed media. It is important to not disturb the cell layers at the bottom of the wells when doing this. Two days after transfection examine positive control cells transfected with pGFP under fluorescent microscope to determine transfection efficiency (Figure 2). SUA5B cells grow very quickly and will become overgrown. Four days after transfection thin these cells by aspirating out the old media and adding slowly an equivalent volume of freshly warmed media. After adding new media to the wells, detach all cells from the bottom of each well by pipeting up and down, discard half the volume (1 mL) of the cell mixture and add 1 mL of fresh warmed media to bring the final volume to 2 mL. Check cells daily to make sure they are healthy and not overgrown, thin as necessary. Allow the cells to grow under normal conditions for five to seven days post transfection before collecting them for analysis. At five to seven days post transfection, collect the cells by aspirating off the old media in all the wells and adding 1 mL of sterile room temperature PBS to each well. Detach cells from bottom of well by pipetting up and down and transfer cell mixture to 5 mL snap cap tubes and immediately analyze cells via flow cytometry. Figure 1. Untransfected healthy A. stephensi MSQ43 (A) and A. gambiae SUA5B (B) cells at approximately 80% confluence. Figure 2. A. stephensi MSQ43 (A) and A. gambiae SUA5B (B) cells transfected with positive control GFP expressing plasmid. Figure 3. 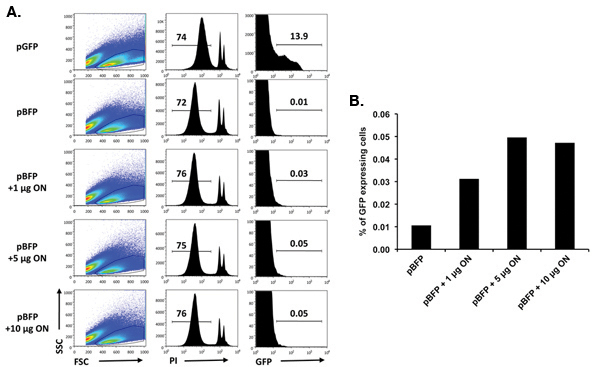 Flow cytometry data confirming conversion of BFP to GFP via mutagenesis of a single nucleotide following transfection with BFP-specific locked nucleic acid-modified oligonucleotides (LNA-ONs). 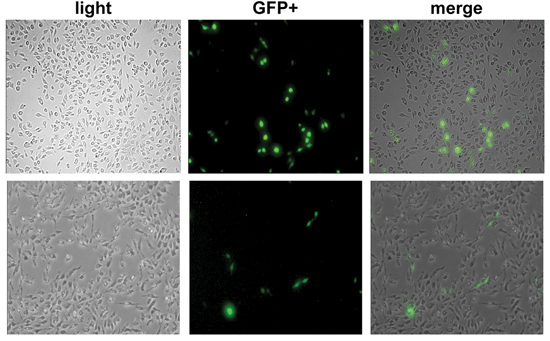 SUA5B cells were transfected with a GFP expressing plasmid (pGFP) as positive control, with a BFP expressing plasmid (pBFP) as a negative control, or with pBFP and increasing concentrations of BFP-specific LNA-ONs. (A) Gating strategy for flow cytometry data showing from left to right: forward versus side scatter of live cells, propidium iodide (PI) negative cells, and GFP positive cells five days following transfection. (B) Graph of percentage of GFP positive cells shown in (A) following transfection with pBFP and increasing concentrations of LNA-ONs. Table II. Transfection conditions used in Figure 1. Here we present an in vitro method and evidence for targeted conversion of a single nucleotide in an episomal gene target following transfection of LNA-ONs into A. stephensi and A. gambiae cells. LNA-ON-mediated gene conversion requires induction of a site-specific DNA repair response; our data indicate that mosquito cells can support this mechanism for site-specific mutagenesis. While the method presented here is based on conversion of an episomal target, our data suggest that LNA-ON-mediated conversion can be optimized for chromosomal targets in mosquito cells as it has been in other systems. Gene conversion, therefore, would facilitate the generation of stably transformed mosquito cell lines without complex protocols and lengthy drug selection regimes. Further, existing technology based on the use of mRNA-specific fluorescent tags in live cells can be leveraged to sort and enrich mosquito cells with converted chromosomal gene targets for biological studies 5-7. The success of this method critically depends on the use of healthy cells at a density of 70-80%. In addition, at all steps during the transfection process it is important to determine that neither the plasmid nor LNA-ONs have precipitated out of solution by checking the solution visually for precipitate. One possible modification of this protocol is to plate the cells 24 hours prior to beginning the transfection process. This is suggested for slow growing or sensitive cell lines. We found that the optimal ratio of plasmid DNA to LNA-ONs was 1:5 but it will be important to determine the ideal ratio for each new gene and cell line of interest. A variety of studies have identified mosquito loci and genes that confer resistance to malaria parasite infection 8-10. If these targets are amenable to manipulation - via the enhancement of or redirection of expression timing - they can provide a basis for genetic engineering as a strategy to control malaria parasite transmission in natural vector populations. The methodology discussed here is a novel and effective technique for introducing mutations into malaria resistance genes in the laboratory. Through these manipulations of genes of interest, we can determine specifically how gene products alter cellular anti-parasite responses in vitro, a critical step to understanding control of malaria parasite development in vivo. We would like to thank Abbie Spinner at the California National Primate Research Center for her assistance with flow cytometry. This study was supported by funding from the National Institute of Allergy and Infectious Diseases (NIAID) National Institutes of Health (NIH) AI073745, AI080799, and AI078183. Corby-Harris, V. D. A., Watkins de Jong, L., Pakpour, N., Antonova, Y., Ziegler, R., Ramberg, F., Lewis, E. E., Brown, J. M., Luckhart, S. L., Riehle, M. A. A novel strategy for controlling malaria transmission in the mosquito Anopheles stephensi. PLOS Pathogens. Forthcoming (2010). Braasch, D. A., Corey, D. R. Locked nucleic acid (LNA): fine-tuning the recognition of DNA and RNA. Chem Biol. 8, 1-7 (2001). Andrieu-Soler, C. Stable transmission of targeted gene modification using single-stranded oligonucleotides with flanking LNAs. Nucleic Acids Res. 33, 3733-3742 (2005). Parekh-Olmedo, H., Drury, M., Kmiec, E. B. Targeted nucleotide exchange in Saccharomyces cerevisiae directed by short oligonucleotides containing locked nucleic acids. Chem Biol. 9, 1073-1084 (2002). Rhee, W. J., Santangelo, P. J., Jo, H., Bao, G. Target accessibility and signal specificity in live-cell detection of BMP-4 mRNA using molecular beacons. Nucleic Acids Res. 36, e30-e30 (2008). Marras, S. A., Kramer, F. R., Tyagi, S. Genotyping SNPs with molecular beacons. Methods Mol Biol. 212, 111-128 (2003). Tyagi, S., Bratu, D. P., Kramer, F. R. Multicolor molecular beacons for allele discrimination. Nat Biotechnol. 16, 49-53 (1998). Blandin, S. A. Dissecting the genetic basis of resistance to malaria parasites in Anopheles gambiae. Science. 326, 147-150 (2009). Niare, O. Genetic loci affecting resistance to human malaria parasites in a West African mosquito vector population. Science. 298, 213-216 (2002). Riehle, M. M. Natural malaria infection in Anopheles gambiae is regulated by a single genomic control region. Science. 312, 577-579 (2006).